1. Intertwingles the RUACH of summer camp with the CONTENT of a stellar Hebrew School. From canteen to color war, Hebrew Wizards has flipped the paradigm on supplemental Jewish education: the school builds and forms a loving community. Replacing books with colorful learning boards, teachers with musicians and highly trained counselors, and desks with couches and rugs. Imagine a world where children want to go to Hebrew School. 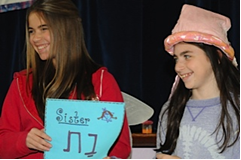 Hebrew Wizards creates a loving, nurturing environment where teens teach and children work together, cheer for one another, and form life-long friendships centered-around Jewish learning. Hebrew Wizards fosters a family environment through "Share Shabbats" and other celebrations. 2. Uses a versatile WIZARDS POSTER BOARD CURRICULUM that enables each learner to master ideas and content at their own speed and according to their own learning style. Hebrew Wizards learn in small self-chosen groups where they receive personal attention and take an active, empowered role in their own learning. Each child is intentionally positioned for success. 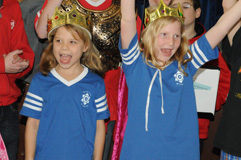 Hebrew Wizards earn treasure coins as they explore the holidays, Israel, the Torah, and prayer through song, art, theater, community, etc. Hebrew Wizards boasts an impressive iPhone app that enables parents and students to learn or review content anywhere. 3. Cultivates a strong supportive community of TEEN WIZARDS who teach, nurture and lead the next generation of Hebrew Wizards. 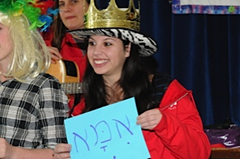 Being a Teen at Hebrew Wizards is an incredibly rewarding and meaningful experience. Hebrew Wizards two prong approach engages teenagers in meaningful personal learning and development while also training them to facilitate the unique Wizards Board Curriculum. Teens are fully supported as they are empowered to be leaders and creators. Teens take their roles very seriously and build meaningful personal relationships with younger students engendering strong connections and personalized learning plans. Young Hebrew Wizards long for the day when they too can become a Teen Wizard. 4. Integrates MUSIC and SONG into all aspects of learning and community. Whether it's time to raise the Degel, say Shm'a or earn wizard points, there's always a guitar playing at Hebrew Wizards! In line with our ancient Jewish tradition: we are serious about music and love our song leaders who help us create memorable and meaningful school experience. Music and song have been shown to have significant impact on learning and retention. Music is fun, and provides a creative way to learn at Wizards. 5. Explores, studies, writes and sings traditional and untraditional songs during TEFILLAH TIME At Hebrew Wizards kids love Tefillah time. We call it "Praying with the Wizards: It's a special part of their day when they can relax, be themselves, and put their arms around friends as they sway and sing together. Our awesome song leaders help us create a warm and loving atmosphere where personal interpretations and community worship are valued. As wizards explore and learn prayers, they are unknowingly preparing for their Bar Mitzvahs and becoming empowered to lead their own services.